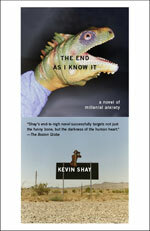 Please visit kshay.com for information about The End as I Know It: A Novel of Millennial Anxiety and other writing by Kevin Shay. Extensions to the popular publishing system. Find terms that appear near each other. Explore how pages relate to one another. See results broken down by host machine. Dubious domain defenses from the WIPO files. The popular joke book from 1739. An 1888 collection of British street songs.